Round three on my cider tour of New Zealand (from the comfort of the couch) sees me sampling a Weka Apple Cider, Moa Breweries entry into the cider game. I come into this review with a level of scepticism. Weka is made by Moa. Moa is a beer company, a rapidly growing beer company. I’m always dubious of beer brewers making Cider. It seems the bigger the company the less chance that real apples are used in the cider. I got even more worried when I found out that one of the brewers on the Moa team is the ex-head brewer of Heineken, they don’t get much bigger than that. My fears subsided when I read this quote form their website. Moa go to great length with their beers to use traditional brewing techniques. Wearing the extra costs and hardships involved making beer this way, as a badge of honour. Josh Scott is the son of a wine maker from the famous wine making region of Marlborough and has studied viticulture so he should know how to handle sugars from fruit. Weka Apple Cider is fermented at lower temperatures. This means that the process takes longer but the fruit’s aromas stay intact. The cider is also fermented with French Oak. I’m unclear whether this means chips in the fermenting tanks or if it was fermented in oak barrels. On a larger scale chips are the norm. By the way a Moa is a big ol’ dino bird that once roamed around where the brewery now stands. A Weka is a slightly less impressive bird. It’s basically a curious Kiwi bush hen, but hey at least they’re still strutting their stuff. Ripe fruit, big apple notes back up by apricot harmonies. This cocktail of aromas are whipped up into you nose by a vigorously bubbly dark orange cider. The heavily ripe Granny Smith apples and stone fruit scents cross over onto the palate. A gentle burnt flavour sits in the background like a toffee or honeycomb. Marketed as a medium dry cider, I think the cider has a medium sweetness; this sweetness fades away quickly for a reasonable long finish. Spring has sprung and this cider is sitting pretty with the sudden on set of warmer weather. Refreshing and well-balanced, round flavour. Coming in at a low 4% you can share a few on the picnic rug. To steal another line from Moa – “Finally, something drinkable from Marlborough”. Yes Weka in a nice cider. It’s one of those hot afternoons with friends in the garden type of drinks sitting with a gooey blue cheese and biscuits. The more Kiwi ciders I try the more great drops I find. 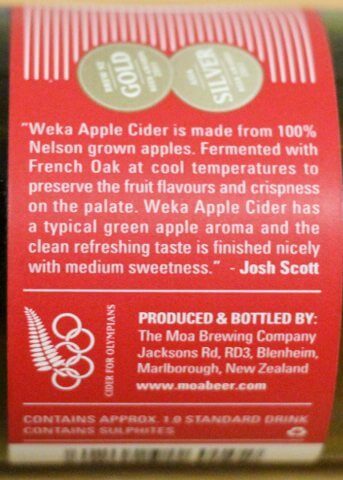 Shame the Weka Apple Cider is so hard to get in mainstream pubs and bottle shops. But hey that’s just an invitation to make like the little bush hen. Be curious and strut your stuff, get out there and find a Weka.